NGALAC on Adam Savages' Tested Webcast! The NGALAC will allow people at Noisebridge to play classic console games, with their classic controllers, and then live stream their gameplay and themselves to the internet with the push of a button. People who want to play classic games will have a nice place to do so. People who have never tried to live stream before can jump in and try it. People who want to raise funds for Noisebridge can turn on the live stream and raise money for Noisebridge. We meet on Friday evenings to coordinate our work for the week and tend to work on NGALAC on Tuesday evenings and Sunday afternoon and evening. Please stop by. Here is the desired experience of seeing and using the NGALAC. There are controller ports on the front of the machine and classic controllers on the sides of the machine. There is a typical Arcade cabinet control board as well with buttons and joysticks. A person presses the 'game' button and finds a game they'd like to play. They select a controller from the collection and plug it into the controller port, or opt continue using the joysticks/buttons. They press 'start' and the game loads. They play. They can control the game volume with a knob. 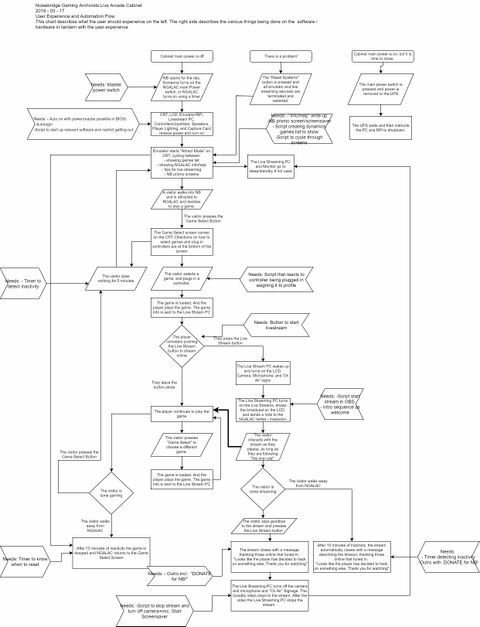 If a player decides they want to stream their session. They press the "Live Stream" button. The Live Stream "wakes up" and starts up. During the Live Stream "wake up" process: The live stream computer comes out of standby, the live stream monitor turns on, the live stream software connects to the 'streaming service(s)', a notification is sent out that someone is streaming, the 'ON AIR' sign and lighting on the cabinet turns on, The microphone and player camera turn on, the player lighting turns on. 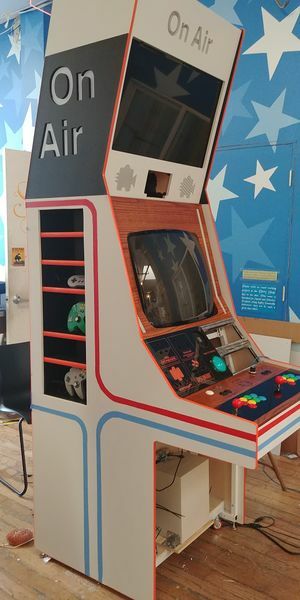 The games on the NGALAC will be curated from the NGA archives and the Live-Streaming will run through Noisebridge's streaming profile(s) and channel(s). When needed for legal purposes, copies of the games running on the cabinet will be kept on site. The cabinet will: be built for two players, be accessible, have decorative lighting, have Noisebridge NGA branding and theming. The cabinet will be located so as to not display a large area of Noisebridge and will have integral signage requesting that potential streamers ask for the consent of others who may be in sight of the stream. The cabinet will have warnings that light up when a stream is happening. 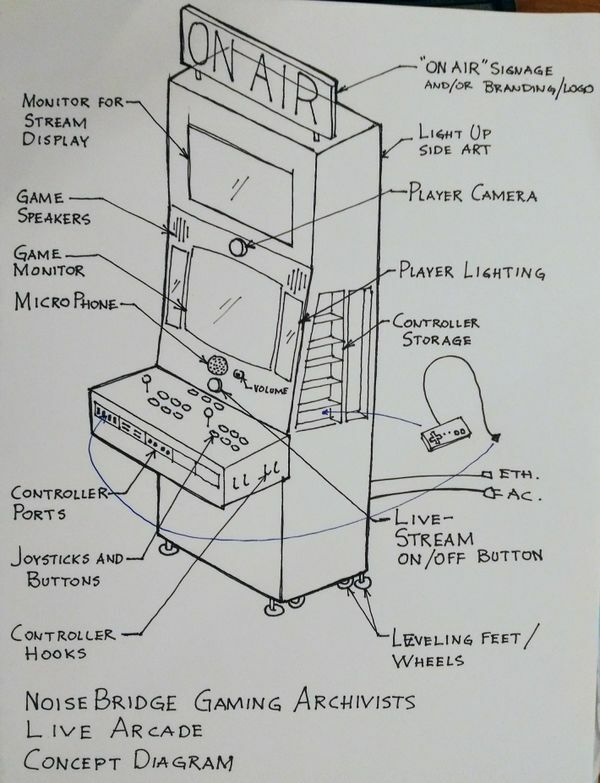 The cabinet design is still far from established, but here are the ideas collected into a drawing. The project is broken up into three sub-systems ideally with a couple persons acting as the leads for each, coordinating on the overall project. While we'll be developing each of the sub-system projects at their own pace, there should be weekly build meetups where we gather the team of volunteers together and collaborate on the project. The controllers need to connect to ports which then connect to adapters and then the emulator. These ports need to be sturdy and able to be mounted on the face of the cabinet. Arduino programming and wiring: accepting inputs from buttons, communicating with Streaming PC, controlling lighting. 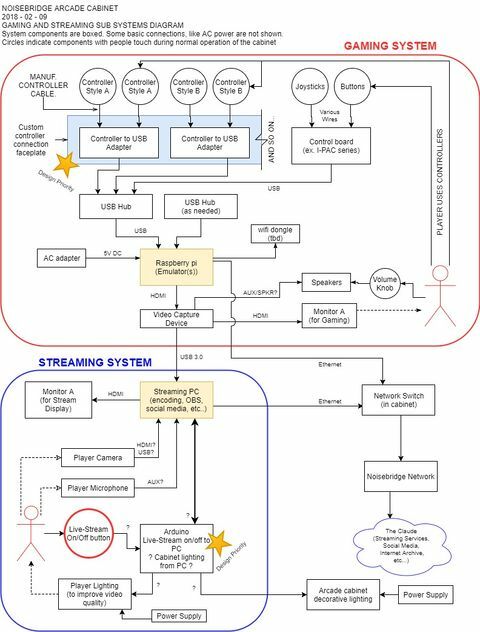 The current diagrammatic layout of the Gaming and Streaming systems shown in this image. Feedback is welcomed. This is being used as the basis for the parts list in the section below. 1. Acquire ROM files LEGALLY. 2. Get on same network as emulation machine. Open file browser window and in the address/directory bar, type: \\RETROPIE . You should now be able to explore the raspberry pi's home directory. 4. Add your rom file(s) to its corresponding console folder. 5. Restart EmulationStation on the Raspberry Pi or reboot the machine. 9. Let it do its thing. Once done, select "cancel/ back/ exit" until you return to the main console. 10. Back out of console into EmulationStation by typing "exit" and enjoy your newly installed roms, complete with cool sidebar infos and videos! 1. Put Rom files onto usb flash drive. 2. Plug flash drive into raspberry pi in back of cabinet. 3. hit 'f4' to exit to unix shell. If that doesn't work, hit button on kvm switch inside cabinet near the middle in order to switch to the raspberry pi for keyboard /mouse (inside drawer under joysticks/buttons). If you don't know what the kvm switch is, ask in channel #nbgamingarchivists on slack for help. 4. copy files to ~/RetroPie/roms/SYSTEMNAME, where SYSTEMNAME is the short name of the corresponding system. Recommended parts list: (Product, Description, Notes) 1. This page was last edited on 30 January 2019, at 08:47.